this side of NY state, with something for everyone. The show features a wide variety of vehicles ranging from original, modified, race, and full custom. to Hot rods, classics, pro street, and unrestored. Showcased at the Buffalo Convention Center in the heart of the revitalized Buffalo, New York. Affordable admission as well as contests and events for everyone. Limited Tickets Available for VIP Celebrity Dinner! Buy your seat now! Come meet Tom Wopat aka Luke Duke, Dennis Gage of “My Classic Car”, Lou Santiago of “Car Fix”, & Dan Woods of “Chop Cut Rebuild” at the 2019 Buffalo Motorama. *Celebrities Guest at their discretion may charge a fee for pictures, autographs, or memorabilia purchase. Come meet one of the “Duke” Boys and the famous General Lee as well, they will both be at the show all 3 days . Come meet Dennis at at the 2019 Buffalo Motorama on Friday and Saturday only. Will also be at the 2019 Buffalo Motorama greeting fans all 3 days. Don’t miss your chance to meet Lou from Car Fix on Velocity, he will be at the show on Friday and Saturday only. Have dinner and hang out with our celebrities! Join us for a fundraising dinner with Tom Wopat (Luke Duke) from Dukes of Hazzard, Lou Santiago from Car Fix, Dennis Gage from My Classic Car, and Dan Woods from Chop Cut Rebuild. - Dinner is at Osteria Restaurant in Buffalo NY from 6pm-8pm Friday March 29. Limited to 40 participants. Who else would you like to see in 2020? We are working on this years lineup of builders, we expect to bring some awesome rides again from some of the builders were featured in past years and hopefully some new local, regional and national ones. So far confirmed Builder for 2019 include Orange County Choppers, Bitchen Customs, California Dreamin Hot Rods, Customs by Kilkeary & RodTech, with many more in the works. Stay tuned for more to be announced! First Time Displayed to the Public In Person the Orange County Choppers Built Sahlen’s Hot Dogs 150th Anniversary Bike. Know of a builder that should be showing at this year's Motorama point them towards our Enter Vehicle Page or send us their info. 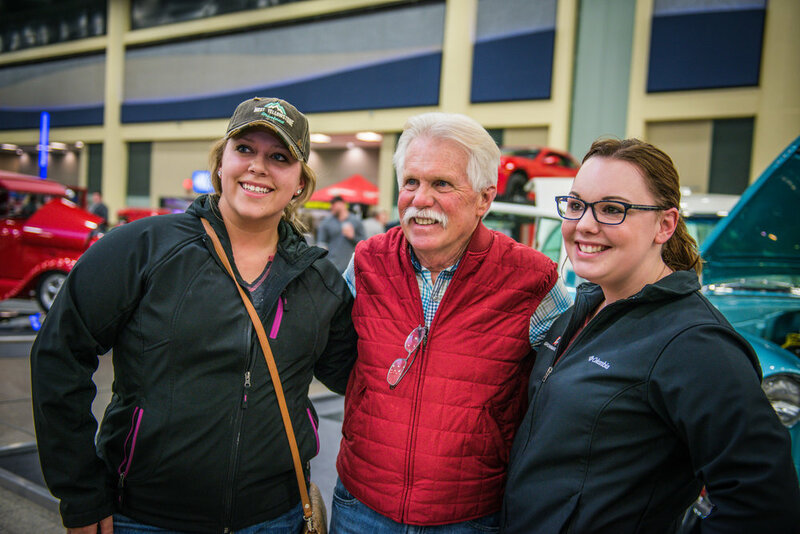 We value our relationship with our exhibiting builders as they are a large part of making Buffalo Motorama a huge success and in turn we've heard of several stories where our event and promotions helped bring new clients. Motorama Best of Show winner, Blizzard, was commissioned by a WNY local resident after meeting the Ring Brothers at the Buffalo Motorama. Many well known builders have been featured at the Buffalo Motorama over the past several years, such as. 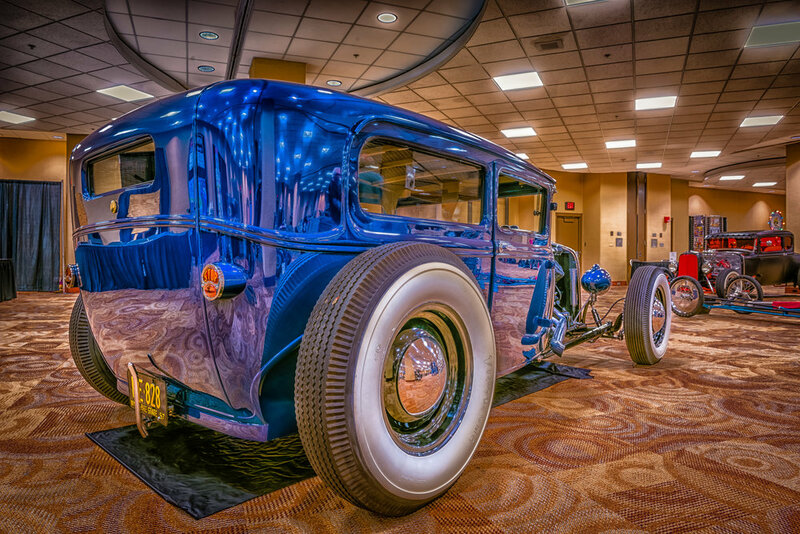 Come see some of the coolest rides from across the United States and Canada all under one roof. 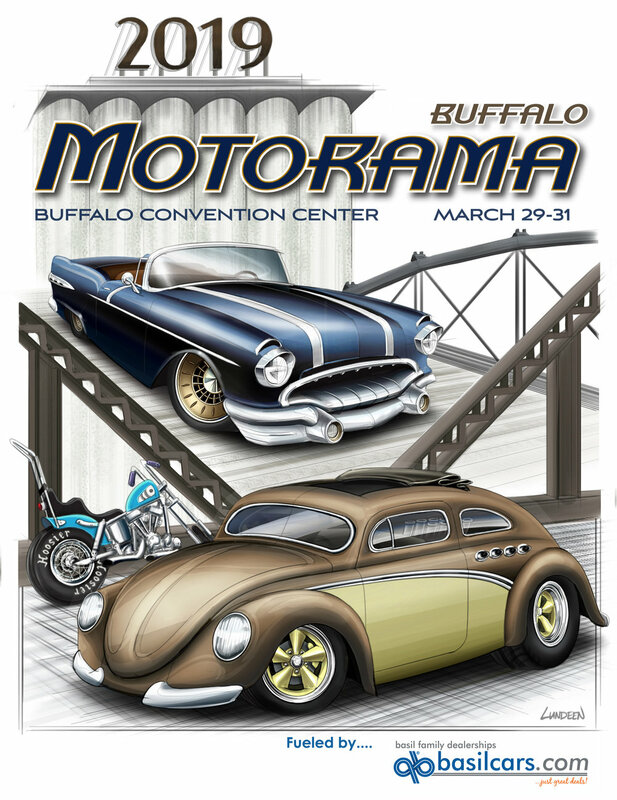 We will soon be taking registrations for vehicles looking to exhibit at the 2019 Buffalo Motorama, if you want to show your ride use visit Enter Vehicle page for more info. The Open Wheel and Hot Rod Room is truly one of the highlights of the Buffalo Motorama. We fill one of our downstairs rooms, (sometimes it spills over into the next) with a whole bunch of Old Skool Hot Rods. We also bring in a bunch of highly talented local pin stripers and you can watch them apply their craft and even pickup so great automotive art in their charity sale. 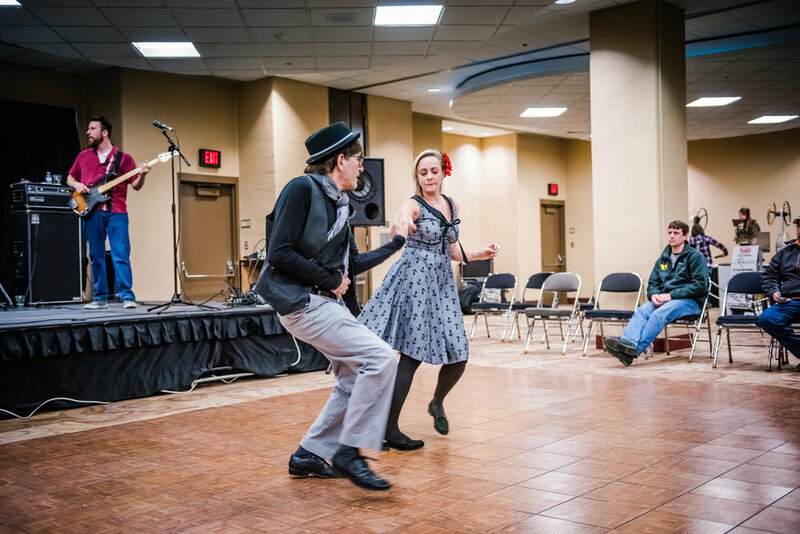 If all that wasn't enough, we pack in performances by multiple Live Bands throughout the show for your listening or dancing pleasure. Looking to be a vendor/sponsor or have a vehicle you want to put in the Open Wheel & Hot Rod Room? Bring the Kids to a car Show! Give a child an experience the won't soon forget! The only way the car hobby survives is if we pass on our love of cars to future generations. 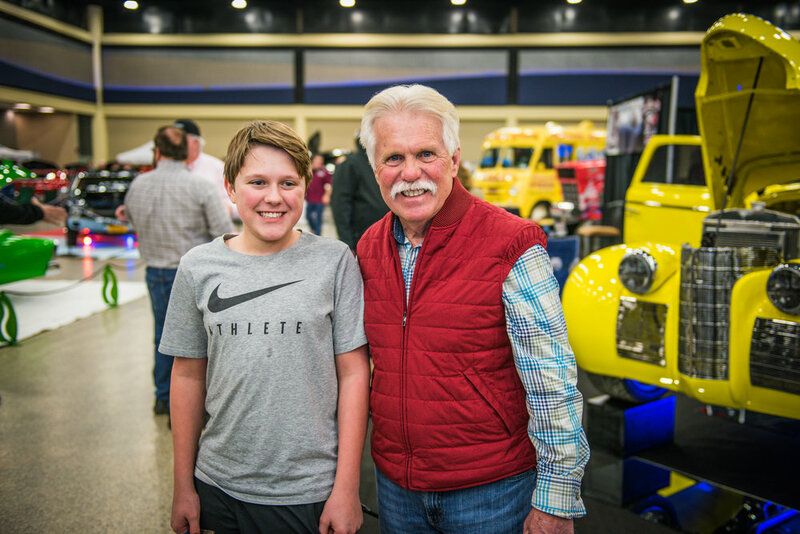 At Buffalo Motorama we truly want to make the event a family affair, so we try and have things for all the family to enjoy. Expect to find plenty of things at our show too keep the kids excited from besides just all the cool cars. In the past we've had costumed characters, photos with the Easter Bunny, coloring contests, etc... Best of all in 2019 we will once again offer free admission to children under 11 years old with paid adult admission. Star Wars Cosplay Characters groups The North Ridge Fan Force & The 501st Legion Nickel City Squad will be there to the interact with visitors for the 2019 Buffalo Motorama on Saturday March 30th: Noon - 6pm & Sunday March 31st from 1pm - 5pm. Visit with Costumed Superhero Characters from The Supehero Alliance. They will be roaming the show for photo opportunities and interacting with kids of all ages. 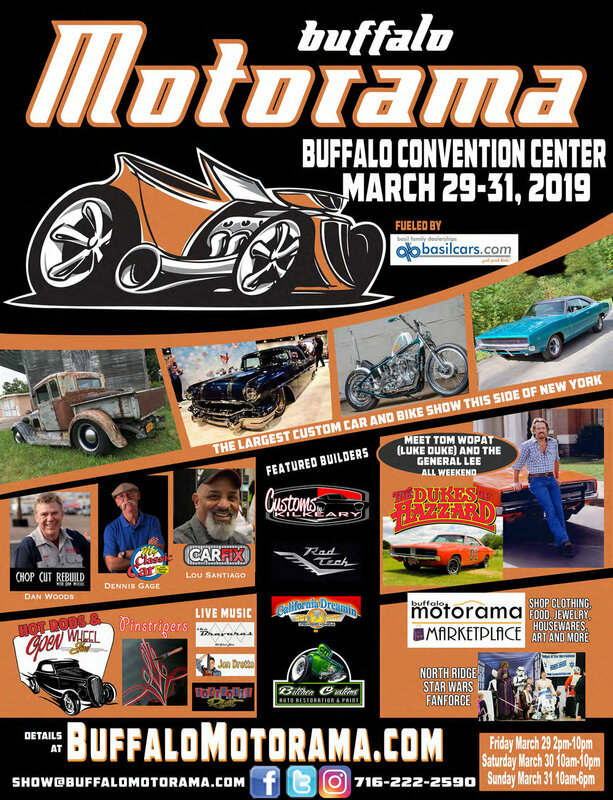 Once again we want to make our show something the "Entire" family can enjoy, the Buffalo Motorama sets one of our downstairs rooms aside for the Motorama marketplace. In this room we feature non-automotive vendors tables for everyone to shop at. As we confirm wendor's for this upcoming years show we will list them here. If you are intrested in becoming a vendor for the Marketplace please check out more inormation under our Vendors and Sponsors Section here.